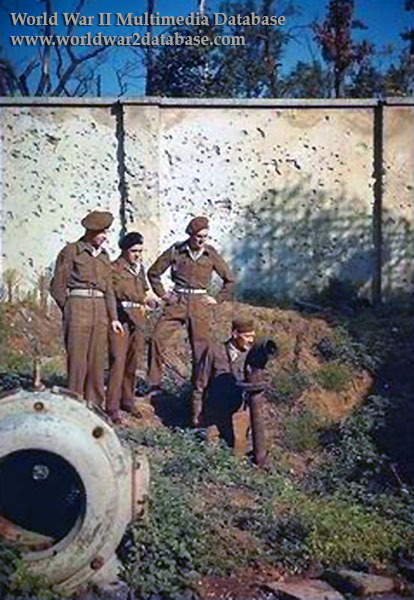 Four British soldiers, who are probably Royal Armoured Corps troops, visit the Reichskanzlei ("Reich Chancellery") garden, and examine the shallow trench where Adolf and Eva Hitler (nee Braun) were cremated after their suicides. The wall behind them separates the Chancellery garden from the Foreign Ministry. During the Potsdam Conference, the Chancellery and the Fuhrerbunker were popular tourist destination for Allied occupation forces. The 7th Armored Division led the British forces into their sector of Berlin on July 4, 1945. 7th Armoured Division tank commander Bill Bellamy was one of the first British officers to visit the Reich Chancellery after occupying the British sector. At the time, Allied troops could pass freely between what would become East and West Berlin. Bellamy later wrote, "We visited the Reichstag first; this was a total burned-out ruin but we saw the tower on which the famous photograph of the Russian soldiers hoisting the national flag was taken. Then on to the Reichskanzlei, walking up the wide ceremonial steps through the front door and into the spacious entrance hall. The building was wrecked, ripped by shellfire and showed graphically the intensity of the battle that was fought in and around it. A Russian guard was on duty at the door but he ignored us. We wandered into Hitler’s study, where only an empty desk remained, drawers scattered all over the floor, a huge stucco German eagle dominating the wall behind it. Then into other huge offices, everywhere the floors were littered with papers. There were thousands of cards and documents lying about everywhere, and a historian would have given his eyes to have been there to sort through them. Eventually we looked out of a window and saw a small garden at the back where, we had been told, Hitler’s bunker was sited and where the bodies of Hitler and Eve Braun were burned by his chauffeur after they had committed suicide. There was a Russian guard there who made it quite clear that it was ‘off limits’, swinging his gun towards us. We didn’t dally! It was an eerie building and I felt as if I had been present just after the sack of Rome by the Goths. There was something very unwholesome about it all, evil really, and the heavy humourless Russian presence didn’t do much to help. It was oppressive, and instinctively each of us wanted to return to the sunshine and to life outside." United Kingdom Prime Minister Winston Churchill arrived July 15, 1945 and visited the bunker on July 16. Accompanied by several generals and officers, he entered the bunker with his daughter Mary.